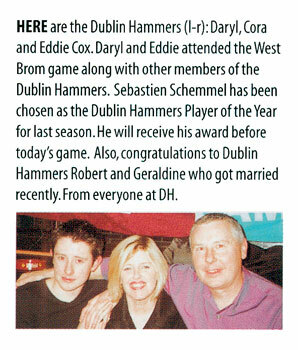 This article on the Dublin Hammers was published in the Club Programme for the match against Arsenal on Sunday 26th October 2008. The West Ham line-up for the fixture included; Green, Faubert, Collins, Upson, Illunga, Mullins, Parker, Bowyer, Di Michele, Bellamy and Cole. 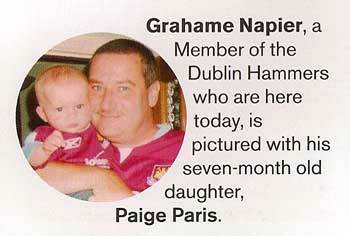 This photograph of Dublin Hammer member Grahame Napier was published in the Club Programme for the match against Middlesbrough on Sunday 23rd October 2005. The West Ham line-up for the fixture included; Carroll, Repka, Konchesky, Mullins, A. Ferdinand, Gabbidon, Benayoun, Reo-Coker, Harewood, Sheringham, Etherington. 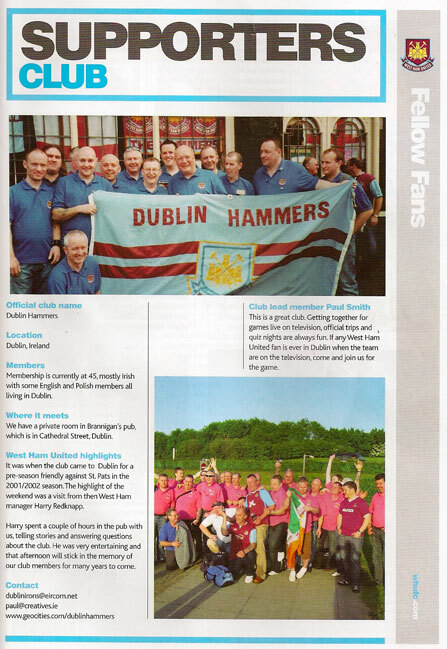 This photograph of Dublin Hammers members was published in the Club Programme for the match against Manchester City on Saturday 21st October 2002. The West Ham line-up for the fixture included; James, Schemmel, Breen, Lomas, Repka, Sinclair, Cole, Kanoute, Carrick, Di Canio.